This is the fourth in a series of "blogicles" on how Mess Mapping™ and Resolution Mapping™ processes can be used to represent, analyze, evaluate Wicked Problems and then to choose actions that ameliorate the Wicked Problem at hand. One of us (Horn) has been working in Visual Language for more than a decade. The diagram above shows the key ideas. Certainly, pictures and words have been combined together in documents since the invention of written language, and especially in ancient Egypt. Horn says that the full integration of words, images, and shapes into a single, unified communication unit continues to emerge as a distinct language. The emergence and evolution of visual language has been substantially driven by computers, cell phones, PDAs, and other communication devices with graphic interfaces and graphic, image and video tools. Words are essential to visual language. They give conceptual shape to communication and supply the capacity to name, define, and classify elements and to discuss abstractions. 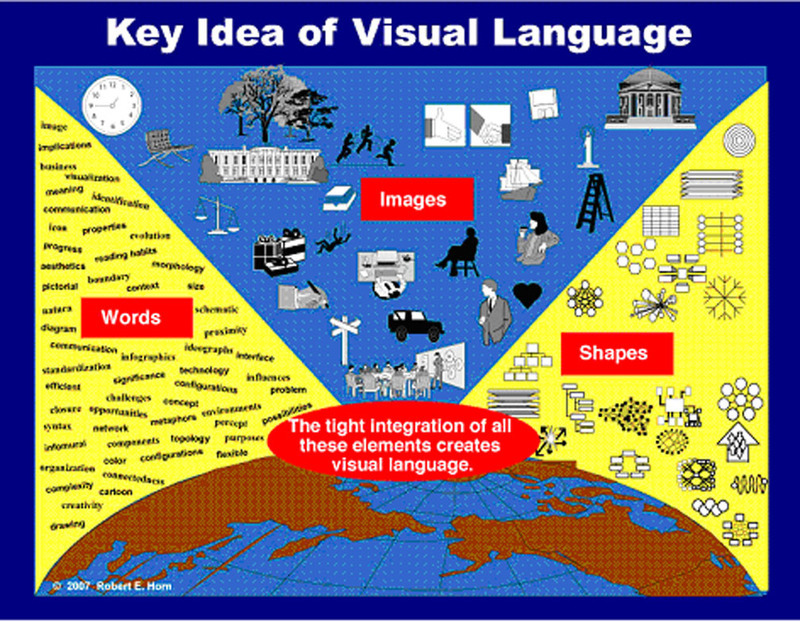 Images, of course, are what we first think of when we think of visual language. But without integration with words and/or shapes, images are only conventional visual art, not visual language as Horn uses the term. Shapes are different from images. They are more abstract. For several centuries, we have been combining them with words to form diagramming systems. The study of shapes and their integration with words and/or images is an essential part of visual language. Visual Language is not about images by themselves, or shapes by themselves, but about the use of images, shapes, and words to create messages comprised of integrated elements.